What to Expect: The inspiration for many vinyasa-style yoga classes, Ashtanga Yoga is an athletic and demanding practice. Traditionally, Ashtanga is taught “Mysore style”: Students learn a series of poses and practice at their own pace while a teacher moves around the room giving adjustments and personalized suggestions. Teachers and Centers: Founded by K. Pattabhi Jois (1915-2009), this system is taught around the world. Jois’s grandson R. Sharath now leads the Shri K. Pattabhi Jois Ashtanga Yoga Institute in Mysore, India. There are teachers everywhere around the globe. What to Expect: This is a physically challenging, flowing practice that will get your heart pumping while also encouraging you to find your authentic personal power in life. Classes feature a vigorous 90-minute sequence, performed in a heated room and designed to condition the whole body. What It’s About: The aim of Baptiste Yoga is to create freedom, peace of mind, and the ability to live more powerfully and authentically right now. The physically challenging practice is a training ground for facing emotional and philosophical challenges that arise in your life. Teachers and Centers: Baron Baptiste, son of yoga pioneers Walt and Magana Baptiste (who opened San Francisco’s first yoga center in 1955), began practicing as a child and studied with many Indian yoga masters. The Baptiste Power Yoga Institute is headquartered in Cambridge, Massachusetts. There are more than 40 affiliated studios. What to Expect: Rooms are heated to 105 degrees, and classes consist of 45 minutes of standing poses and 45 minutes of floor postures. You do the same series of two breathing exercises and 26 poses in each class. What It’s About: This practice is designed to work your body and requires full mental concentration. The overall objective is to create a fit body and mind, allowing the physical self to unify with the spiritual self. Teachers and Centers: Bikram Choudhury was born in Calcutta and introduced his system in the United States in 1971. His main teacher was Bishnu Ghosh (1903-1970). The Bikram Yoga College of India in Los Angeles serves as headquarters. There are now more than 5,000 certified Bikram teachers throughout the United States. What to expect: A strong, hot practice designed to help you release physical and emotional tension and pain, and celebrate the strength of your own body. What It’s About: Working with the premise that clearing stored emotions makes room for your spirit to come home, the practice combines physically challenging sequences with deep emotional exploration. Teachers and Centers: Ana Forrest began teaching Forrest Yoga in 1982. She studied various systems of yoga, healing, and native ceremony but credits her own pain and suffering, her students, the elements, and “the great mysterious” as her primary teachers. What to Expect: A gentle practice based on chanting, postures, deep relaxation, breathing practices, and meditation. What It’s About: Integral Yoga focuses on returning us to our “natural condition,” which includes health and strength, a clear and calm mind, a heart full of love, a strong yet pliable will, and a life filled with supreme joy. Teachers and Centers: Founded by Swami Satchidananda (1914-2002), a student of Swami Sivananda, Integral Yoga is taught at the Satchidananda Ashram (Yogaville) in Virginia and the Integral Yoga Institute in Manhattan as well as at smaller centers and in studios. What to Expect: Classes include alignment-based vinyasa sequences, with meditation, Pranayama (breathwork), and kriyas (cleansing techniques) to create specific energetic effects. What It’s About: ISHTA stands for the Integrated Science of Hatha, Tantra, and Ayurveda, and its aim is to balance the human organism to create a strong and stable platform for spiritual growth. Teachers and Centers: Alan Finger laid the foundations for Ishta Yoga with his father, Kavi Yogiraj Mani Finger (a disciple of Paramahansa Yogananda and Swami Venkatesananda) in South Africa in the 1960s. The Ishta Yoga School in Manhattan was opened in 2008. What to Expect: Often, you’ll do only a few poses while exploring the subtle actions required to master proper alignment. Poses can be modified with props, making the practice accessible to all. What It’s About: For beginners, the primary objective is to understand the alignment and basic structure of the poses, and to gain greater physical awareness, strength, and flexibility. Teachers and Centers: B.K.S. Iyengar (a student of T. Krishnamacharya) founded the style. His children Gita and Prashant Iyengar teach in Pune, India, and around the world. There are four Iyengar institutes in the United States: in New York, Los Angeles, San Francisco, and Champaign-Urbana, Illinois. What to Expect: A physically vigorous and intellectually stimulating practice with a focus on spiritual development. Expect to encounter flowing asana sequences along with Sanskrit chanting, references to scriptural texts, eclectic music (from the Beatles to Moby), yogic breathing practices, and meditation. What It’s About: One of the predominant principles of Jivamukti Yoga isahimsa (nonharming), and classes often explore the link between yoga and animal rights, veganism, and activism. Teachers and Centers: Jivamukti means “liberation while living.” Sharon Gannon and David Life founded Jivamukti Yoga in 1984, choosing the name as a reminder that the ultimate aim is enlightenment. Find centers in New York, Toronto, Munich, London, and Charleston, South Carolina. What to Expect: Through asana, pranayama, meditation, and relaxation techniques, you’ll learn to observe the sensations in the body and mind, and thereby discover how well a pose, or a life decision, is serving you. Classes can be physically demanding or extremely gentle, such as chair yoga. What It’s About: The primary objective is to awaken the flow of prana—the natural life force that will enable you to thrive in all aspects of life. Teachers and Centers: Swami Kripalu (1913-1981) was a Kundalini Yoga master who taught that all the world’s wisdom traditions stem from a single universal truth, which each of us can experience directly. The main center is the Kripalu Center for Yoga & Health in Stockbridge, Massachusetts. What to Expect: A 90-minute class typically begins with chanting and ends with singing, and in between features asana, pranayama, and meditation designed to create a specific outcome. Expect to encounter challenging breathing exercises, including the rapid pranayama known as Breath of Fire, mini-meditations, mantras, mudras (sealing gestures), and vigorous movement-oriented postures, often repeated for minutes, that will push you to your limit—and beyond. What It’s About: Kundalini Yoga is sometimes called the Yoga of Awareness. The primary goal is to awaken kundalini energy, the psychoenergetic force that leads to spiritual elevation, and kick-start the process of transformation. Teachers and Centers: Kundalini Yoga was founded in the United States in 1969 by Yogi Bhajan. There are more than 5,000 certified Kundalini Yoga teachers in the United States. What to Expect: Medium-paced vinyasa sequences combined with alignment instruction and Tibetan Buddhist concepts like mindfulness and compassion. What It’s About: The aim is to cultivate strength, stability, and clarity and integrate mindfulness and compassion into your whole life. Teachers and Centers: OM founder Cyndi Lee has practiced yoga since 1971 and Tibetan Buddhism since 1987. The OM Yoga Center is in New York City. What to Expect: Combining Tantric philosophy with dynamic practice, classes include challenging asanas with an emphasis on the practices of pranayama, meditation, mudras, and bandhas (locks). What It’s About: Rooted in ancient texts and modern life, this practice reveals how asana affects and transforms energy. Its aim is to manifest spiritual and worldly success through increased Self-awareness and the refinement of prana. Teachers and Centers: Rod Stryker, a student of Kavi Yogiraj Mani Finger and Pandit Rajmani Tigunait, founded ParaYoga in 1995. What to Expect: “Challenging” and “empowering” are touchstone words for this active, fluid form of vinyasa yoga. After the opening Om, the class is an exercise in near-continuous motion. Sequences are creative, often incorporating elements of dance and moving meditation, and accompanied by music. What It’s About: The practice is a vehicle to connect with prana. Teachers and Centers: With a background in dance, yoga, Ayurveda, and Indian martial arts, Shiva Rea founded Prana Flow Yoga in 2005. What to Expect: Classes are asana focused, with adherence to the alignment principles of Iyengar Yoga and incorporation of yogic philosophy. Short meditations begin and end class to connect students with the heart center. What It’s About: The emphasis is on uniting the body and mind with the spirit. There are four limbs to Purna Yoga: meditation, asana and pranayama, applied philosophy, and nutrition and lifestyle. Teachers and Centers: Inspired by the work of Sri Aurobindo and the Mother, Purna Yoga was officially founded by Aadil and Mirra Palkhivala in 2003. The main center is in Bellevue, Washington. What to Expect: Based on the teachings of Swami Sivananda, this yoga style is more spiritual practice than exercise. Each 90-minute class focuses on 12 core poses and Sanskrit chanting, pranayama practices, meditation, and relaxation. What It’s About: Designed to transform and elevate human consciousness, Sivananda Yoga focuses on five fundamental points of yoga: proper exercise, proper breathing, proper relaxation (Corpse Pose), proper diet (vegetarianism), and positive thinking and meditation. Teachers and Centers: Sivananda Yoga was founded in 1957 by Swami Vishnu-devananda (1927-1993), a primary student of Swami Sivananda (1887-1963). Large teaching centers can be found in New York City, Chicago, Los Angeles, San Francisco, Montreal, and Toronto. What to Expect: Classes include a lot of floor work with ample propping and hands-on adjustments. Classes begin and end in Savasana (Corpse Pose) and focus on releasing tension. What It’s About: Svaroopa means “the bliss of your own Being.” It refers to the Tantric view of the body as a form of consciousness. The goal is to create “core opening” to remove energetic impediments to inner transformation. Teachers and Centers: Svaroopa was founded in 1992 by Swami Nirmalananda Saraswati, a longtime student of Swami Muktananda (1908-1982), who has been ordained into the order of Saraswati monks. What to Expect: A flowing asana practice, pranayama, mudras, dharana (concentration) practice, and meditation. What It’s About: The wavelike spinal movements and synchronized breathing are designed to awaken prana. Teachers and Centers: TriYoga was created by yogini Kali Ray, in 1980. Ray had experienced a kundalini awakening and created the practice in the manner of kundalini-inspired hatha yoga. The main TriYoga Center is located in Los Angeles; other centers are in Santa Cruz, California, Massachusetts, Pennsylvania, Iowa, and around the world. What to Expect: Tailored to individual needs, classes vary greatly and may include asana, pranayama, chanting, meditation, prayer, and ritual. All classes emphasize mobilizing the spine and coordinating movement with breath. What It’s About: Viniyoga is a useful therapeutic tool for the body, but it also aims to develop the breath, voice, memory, intellect, character, and heart. The practice views yoga as a means to cultivate the positive, reduce the negative, and help each practitioner achieve discriminative awareness—the key to any process of self-transformation. Teachers and Centers: Gary Kraftsow founded the American Viniyoga Institute in 1999. His main teacher was T.K.V. Desikachar. Gary Kraftsow and Mirka Scalco Kraftsow are the senior Viniyoga teachers. What to Expect: Classes are taught one-on-one or in very small groups, with a great deal of individualization. In the asana practice, each movement is coordinated with a particular breath (an inhalation, an exhalation, or a hold), and the effects are often felt in the body and breath, but also in the emotions. What It’s About: Students like to say they practice not to be better yogis for the hour that they are on their mat, but to live more fully and with more ease the other 23 hours of the day. Teachers and Centers: Sri T. Krishnamacharya (1888-1989) is known as the father of modern yoga. At the Krishnamacharya Yoga Mandiram in Chennai, India, his son, T.K.V. Desikachar, and grandson, Kausthub Desikachar, continue his tradition of making ancient teachings relevant for the modern world. American yogis often gravitate toward practices of fiery, strength-building intensity. In fact, the most ubiquitous sequence in the West is surely the ultimate heat builder, the Sun Salutation. The sequence’s Sanskrit name, Surya Namaskar, is literally translated as “bow to the sun.” And as you lift your arms and then bow down, as you lengthen forward and jump back, you begin to embody solar energy. You stretch, strengthen, and warm your whole being from the inside out. But on days when you’re feeling depleted, overstimulated, or overheated, it’s good to know that Surya Namaskar has a soothing sister sequence known as Chandra Namaskar, or Moon Salutation. As the name suggests, Chandra Namaskar is a quieting sequence that invites you to bow to and cultivate the moon’s soothing lunar energy. But the idea of looking to the moon for rejuvenation is certainly not new. In fact, the Shiva Samhita, a 500-year-old Tantric text, regarded the moon as the source of immortality. In The Alchemical Body, David Gordon White, a professor of religious studies at the University of California, Santa Barbara, describes how practitioners of Tantra (a form of yoga that preceded hatha yoga) believed that the “sun” was located in the solar plexus; the “moon,” in the crown of the head. The moon was thought to contain amrita, “the stuff of the macrocosmic moon, the divine nectar of immortality,” which “pours itself into the world in the form of vivifying rain.” While the fiery sun in the abdomen was important for triggering the yogic process, its heat would, over time, cause aging, decay, and death. To reverse this process, yogis did specific practices, such as inversions or mudras (locks, or seals), to both preserve and produce amrita. The act of turning upside down was believed to draw vital fluids from the lower chakras up to the crown, where they would be transformed into amrita (also referred to as soma). This meditation, adapted from the Bihar School of Yoga, can be done before or after you take the final resting pose, Savasana (Corpse Pose). Shiva Rea, the renowned creator of Prana Flow Yoga, designed the sequence beginning on the next page to link asanas with particular feelings or states of being, known as bhavas. Rea believes that every pose elicits certain bhavas and that by becoming aware of the feelings that arise during your asana practice, you can create a strong connection with your deepest intentions. To that end, Rea combines each asana with intentions to invoke through your practice. In Vajrasana (Thunderbolt Pose), for example, Rea suggests the affirmation “I am awakening ___.” After assuming the shape of Vajrasana, say, “I am awakening” aloud and see what comes to mind. Perhaps you are awakening courage, or awakening to new possibilities in your life. Complete each affirmation as you go, seeing what comes up as you assume the shape of the pose. Alternatively, you can choose one intention, such as hope, humility, or strength, and use that as the focus of your entire practice. In the Hindu tradition, gods and goddesses dance as a way of expressing the dynamic energy of life. The image of Nataraja represents the god of gods, Shiva, as the Lord of the Dance, choreographing the eternal dance of the universe as well as more earthly forms such as Indian classical dance (which is said to have originated from his teachings). In Hindu mythology Shiva is also Yogiraj, the consummate yogi, who is said to have created more than 840,000 asanas, among them the hatha yoga poses we do today. While a cultural outsider may not relate to these mythic dimensions in a literal way, dancers in India revere the divine origins of their dances, which were revealed to the sage Bharata and transcribed by him into the classic text on dance drama, the Natya Shastra (circa 200 c.e.). What many practitioners of yoga do not know is that one of the central texts of yoga, Patanjali’s Yoga Sutra, written around the same time, was also inspired by an encounter with Nataraja. Srivatsa Ramaswami, Chennai-based yoga teacher, scholar, and longtime student of yoga master T. Krishnamacharya, includes a pivotal story of how Patanjali came to write the Yoga Sutra in his book Yoga for the Three Stages of Life. In Ramaswami’s account, Patanjali, a young man with a great yogic destiny, is drawn to leave home to do tapas (intensive meditation) and receive the darshana of Shiva’s dance. Eventually Shiva becomes so taken by Patanjali’s ekagrya (one-pointed focus) that he appears before Patanjali and promises to reveal his dance to the young yogi at Chidambaram, a Nataraja temple in present-day Tamil Nadu. At Chidambaram, Patanjali encounters a golden theater filled with many divine beings and sages. To Patanjali’s wonderment, Brahma, Indra, and Saraswati start to play their sacred instruments. Shiva then begins his ananda tandava (“dance of ultimate bliss”). As Ramaswami tells it, “The great tandava starts with a slow rhythm and in time reaches its crescendo. Engrossed completely in the divine dance, the great sages lose their separate identities and merge with the great oneness created by the tandava.” At the end of the dance, Shiva asks Patanjali to write the Mahabhasya, his commentaries on Sanskrit grammar, as well as the Yoga Sutra, the yogic text most widely used by Western yoga practitioners today. Another area where dance and hatha yoga meet is in the actual sadhana (practice), where there are many parallels between the two arts in both the technique and spirit (bhava) of the dance. The tradition is passed from guru to shishya (student) in a live transmission; the teacher gives the proper adjustments and guides the students into the inner arts of the practice. All of Indian classical dance refers back to the Natya Shastra text for an elaborate classification of the form. If you thought the technique of asana was detailed, you should peruse the Natya Shastra: It not only describes all the movements of the major limbs (angas)—the head, chest, sides, hips, hands, and feet—but also offers a detailed description of the actions of the minor limbs (upangas)—including intricate movements of the eyebrows, eyeballs, eyelids, chin, and even the nose—to create specific moods and effects. As in hatha yoga, one begins with the basics of body mechanics and gradually moves toward the subtler aspects of the art. 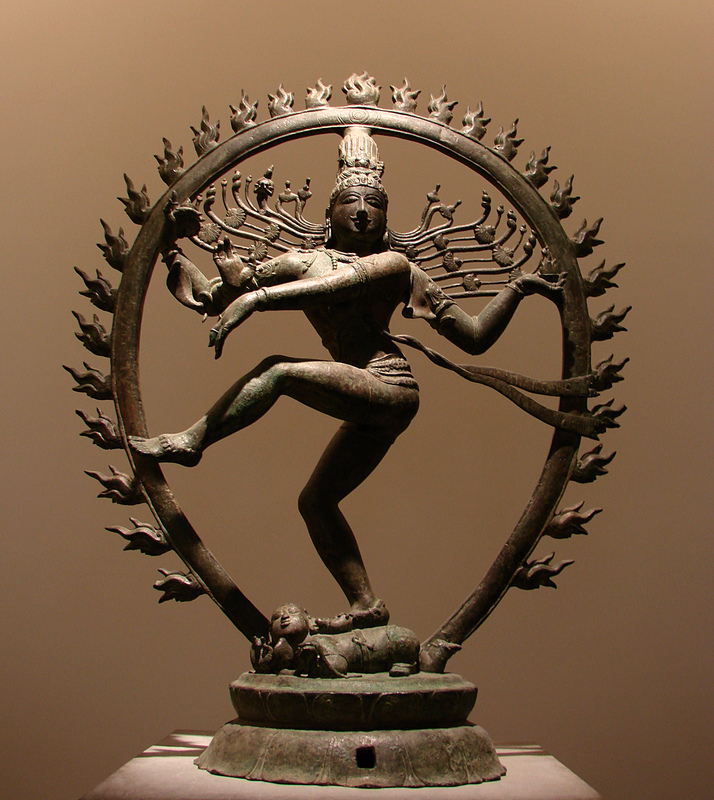 The karanas, dance counterparts of asanas, are linked into a sequence known as angaharas. Ramaa Bharadvaj compares angaharas to the flowing yoga of vinyasa, in which the “dance” of yoga is experienced as the linking of one asana to the next through the breath. “Even though a posture can be held,” she says, “it is really part of a flow. It’s like the Ganges coming down from the Himalayas: Although it passes Rishikesh and then Varanasi, it doesn’t stop; it keeps flowing.” Like the alignment of asanas, the karanas are based on the center line of the body in relation to gravity and include not only placement of the body but also attention to the pathways of energies that flow through the body. Down Dog very clearly puts you in touch with the inherent isometric or push-pull dynamics of yoga asanas, where a movement in one direction is balanced and enhanced by an action in the opposite direction. This has deep philosophical and spiritual significance, corresponding to the meaning of hatha yoga as the union of the sun and moon, the masculine and feminine. The practical benefit of this yogic principle is that in any pose, Down Dog included, you are simultaneously creating strength and flexibility, extension and stability. The first thing about Down Dog is learning to ritualistically place your hands in alignment with your shoulders and hips. As you lift your pelvis to the ceiling and draw your hips back, look at your feet. They should be hip-distance apart, aligned with your pelvis. Beginners will often walk their feet towards their hands to prematurely bring their heels to the ground. Have patience, grasshopper. Your heels may or may not touch the ground, but you want to feel that you have room to continuously grow in this pose. What is the farthest vertical point from your hands in Down Dog? Your hips. What is the farthest point down from your hips? Your heels. Assume your Down Dog now and work those opposite points away from each other. Press into your hands and stretch your hips back from the tops of your thighs. Try to ground your heels. (Even if they don’t touch the floor, imagine roots growing from your heels down through the earth.) This movement starts to stretch your spine while evenly opening your hamstrings, hips, and shoulders. To get the blissful feeling and benefits of Down Dog, you need to shift your weight back into your hips. Again assume your best Down Dog. This time bend your knees so that you can really stretch back into your hips by simultaneously pressing into your hands, extending your arms, and drawing your belly slightly in. Imagine that someone is pulling back on your hips. When you get that “Aha!” it will feel as if your weight is centered in your pelvis, and your arms will feel light. If your hamstrings are very tight, you may need to practice like this for a while, gradually straightening your legs as if a strong wind were pressing your thighs and shins back. You can also place a block between the middle of your inner thighs to learn how to work your legs and develop the inner rotation of the thighs. Grip the block and press it back to feel greater extension in your spine. Learning how to both internally and externally rotate your arms at the same time to connect to your inner wrist, open your shoulders, and broaden your upper back is a key Down Dog trick. Start on your knees again with your hands in position. Typically the inner wrists start to peel off the ground, causing stress on your joints and a subtle disconnection. To ground through your inner wrist, internally rotate your arms towards each other from your elbows down. Thanks to the anatomy of your arms, your upper arms are naturally going to move in the opposite direction (external rotation). To witness how this happens naturally, when you press back into Down Dog, bend your elbows to the side in a diamond shape. Now rotate your elbows under and straighten your arms, maintaining the internal rotation from your elbow to your inner wrist. You should feel your shoulders broadening. If this seems confusing, just try rotating your arms in the opposite direction and see how compressed the area around your neck feels. Are you starting to feel any sukha arising as you find relief in your shoulders and neck? Often humans aren’t sure what to do with their necks in Down Dog. The general tip is to align the crown of your head with the natural line of your spine. If you tilt the crown of your head up, you crunch your cervical vertebrae. Dropping your head forward gives you a nice stretch, but over time can stress your neck. When you are in Down Dog, try aligning your ears with your upper arms. That should connect your head with your spine, simultaneously supporting your head while lengthening the sides of your neck. Now is the time to breathe life and vitality into your Down Dog. On the inhalation, emphasize the broadening of your shoulders and extension through your arms to bring more space into your lungs. As you exhale, focus on the movement of your legs back and down through your shins and heels. As you relax, you will start to feel how nourishing this stretch is.